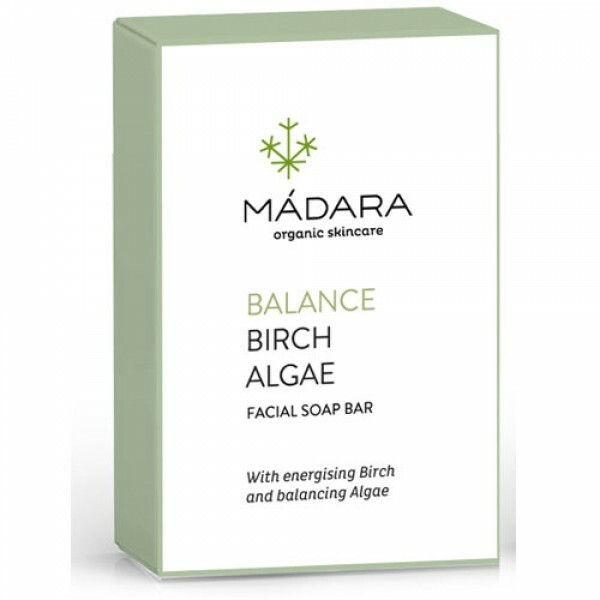 Ideal for combination & oily skins, Birch & Algae balancing face soap is enriched with skin nourishing wheat germ oil and plant sugars helping the skin to retain its moisture whilst leaving it scrupulously clean. Vitamins and minerals of the Nordic birch and algae balance the skin, while botanical soap base gently cleanses and washes away all impurities. Madara products come from Latvia and use plant essences and extracts particular to the Baltic region. They have beautiful fresh scents and are a joy to use. Their products are highly effective and certified organic by Ecocert. sodium palmate*,sodium cocoate*,aqua, glycerin*, aroma,sodium citrate,Betula alba (Birch) leaf extract*,algae extract,C177019 (Mica)***CI77981 (Titanum dioxide)***,triticum vulgare (Wheat) germ oil*,tocopherol,betaine, CI77288***Linalool**limonene**. *organically farmed ingredients, *** naturally occurring minerals. Use as soap to wash your face.